Hello lovely people and welcome to my blog! The first, I hope, of many on my journey through the wonderful world of crochet and crafting. 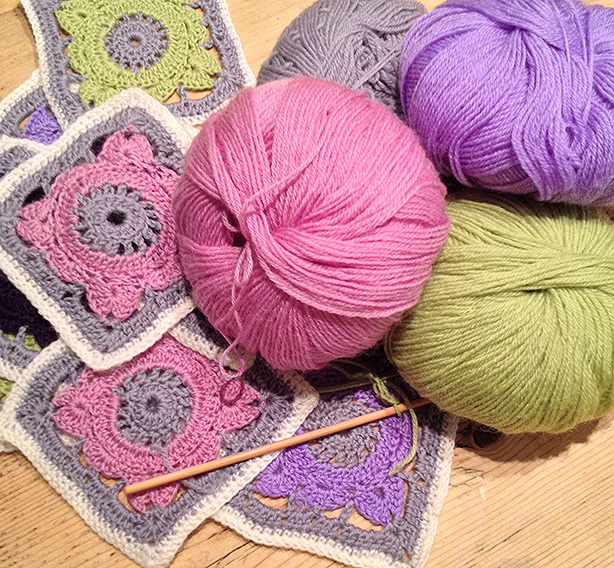 This Blog and website are the latest exciting thing to happen in a series of exciting stuff that has been going on recently – the most fantastic of which is little ‘ol me becoming a regular designer for the wonderful Simply Crochet Magazine (squeee!) My weeks now pass in a blissful flurry of designs and deadlines, the joys and frustrations of which I hope you will share with me on these pages, along with the general musings of a yarn obsessed person, such that I am! It is quite a big step for me to get out there on the internet! Crochet for me always used to be very personal and cosy – a chair by the fire and a cup of cocoa when the kids are in bed or on a picnic blanket in the park while the little ones run in the sun! For a long time I was the only person I knew who crocheted (and knitted) and so my crochet was often a very private affair – like a secret friend who went with me everywhere ready to save me from daily boredom or frustration. I love that feeling! The rhythm of the hook running smoothly through the yarn and the project growing longer beneath my fingers . A soothing creative vibe that has got me through many a night vigil with poorly little ones or fraught sessions on the history essay that the pre teen can just not see the point in writing! These days though my life pretty much revolves around woolly pursuits! We moved from London to the West Country four years ago and since then I have immersed myself in a wonderful world of wool which involves teaching local workshops, helping out in the brilliant ’Wool Bath’ shop (pretty much the centre of my universe but more about that in later blogs!) and now designing for Simply Crochet. And I have got so much out of the wonderful designers and bloggers on the internet, always at the ready with inspiration, knowledge and advice, that I have taken a deep breath, raised my head over the virtual parapet and here I am! Lovely to meet you! Fancy learning crochet or knitting with me on a one-to-one basis? Sessions are available on request for beginner or intermediate knitting and crochet. Contact me to arrange and book. © Sara Huntington 2019. All Rights Reserved.